Asia, making it a natural gateway to Indochina, Myanmar and Southern China. Its shape and geography divide into four natural regions : the mountains and forests of the North; the vast rice fields of the Central Plains; the semi-arid farm lands of the Northeast plateau; and the tropical islands and long coastline of the peninsula South. In northern Thailand the seasons are clearly defined. Between November and May the weather is mostly dry, however this is broken up into the periods November to February and March to May. The later of these two periods has the higher relative temperatures as although the northeast monsoon does not directly effect the northern area of Thailand, it does cause cooling breezes from November to February. The other northern season is from May to November and is dominated by the southwest monsoon, during which time rainfall in the north is at its heaviest. The southern region of Thailand really has only two seasons -- the wet and the dry. These seasons do not run at the same time on both the east and west side of the peninsular. On the west coast the southwest monsoon brings rain and often heavy storms from April through to October, whilst on the east coast the most rain falls between September and December. The Thai people founded their kingdom in the southern part of China, which is Yunnan, Kwangsi and Canton today. A great number of people migrated south as far as the Chao Phraya Basin and settled down over the Central Plain under the sovereignty of the Khmer Empire, whose culture they probably accepted. The Thai people founded their independent state of Sukhothai around 1238 A.D., which marks the beginning of the Sukhothai Perio. Thais began to emerge as a dominant force in the region in the13th century, gradually asserting independence from existing Khmer and Mon kingdoms. Called by its rulers "the dawn of happiness", this is often considered the golden era of Thai history, an ideal Thai state in a land of plenty governed by paternal and benevolent kings, the most famous of whom was King Ramkhamhaeng the Great. However in 1350, the mightier state of Ayutthaya exerted its influence over Sukhothai. Throughout her long history, Thailand has gently absorbed immigrants. Many were skilled as writers, painters, sculptors, dancers, musicians and architects, and helped enrich indigenous culture. 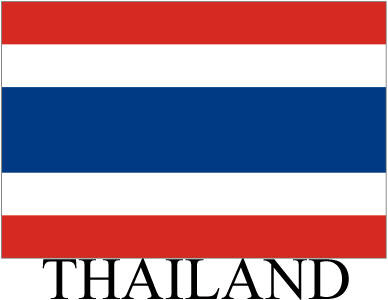 People inhabiting Thailand today share rich ethnic diversity - mainly Thai, Mon, Khmer, Laotian, Chinese, Malay, Persian and Indian stock - with the result that there is no typically Thai physiognomy or physique. There are petite Thais, statuesque Thais, round-faced Thais, dark-skinned Thais and light-skinned Thais. Some 80% of all Thais are connected in some way with agriculture which, in varying degrees, influences and is influenced by the religious ceremonies and festivals that help make Thailand such a distinctive country. Spoken and written Thai remain largely incomprehensible to the casual visitor. However, English is widely understood, particularly in Bangkok where it is almost the major commercial language. English and other European languages are spoken in most hotels, shops and restaurants, in major tourist destinations, and Thai-English road and street signs are found nation-wide.